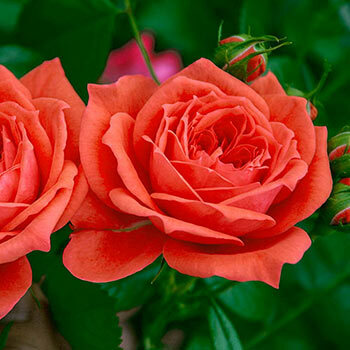 Jolie Veranda Rose - Compact Floribunda | Michigan Bulb Co. Flower Form: Medium, very full & old fashioned Floribunda. 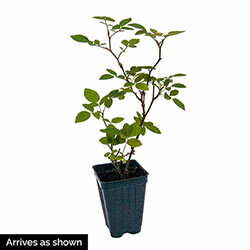 Blooms feature dense, full clusters up to 4'' wide. Flowers are cupped and double. Planting Instructions: Dig a hole large enough to allow roots to be spread out. Plant at same level as the soil so crown of plant is even with soil level. Do not bury crown. Firm and water in thoroughly. Planting in full sun is best for faster flowering and higher quality. Pruning: No need to deadhead due to self-cleaning. Winter Care: In cold climates mound up soil 8" - 10" after ground has frozen. Remove in spring before growth starts. Mulch heavily around the base of the plant.